With it’s distinctive and multi-award winning ‘wave’ design the Tungsten Smart-Heat Gas Portable heater delivers performance, durability and elegance in one highly mobile package. 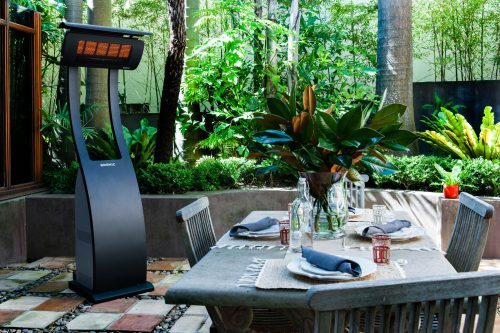 Easy to relocate and powerful, the Tungsten Smart-Heat Portable Gas heater is able to create warm and inviting outdoor spaces virtually anywhere you choose. Coverage of up to 20m2, the Tungsten Smart-Heat Portable delivers a widespread heat held of up to 4m wide and 5m deep. Unique and patented adjustable heat control ensures comfortable heat. High intensity ceramic burner, delivering optimal heat with minimal heat loss. Specifically built to provide constant and consistent heat in any environment. Innovative adjustable tilting head ensures warmth goes exactly where you want it. Functional and pragmatic, the Tungsten Smart-Heat Portable can easily be assembled, dismantled and stored. Anti-tilt structure with built-in wheels for easy movement.